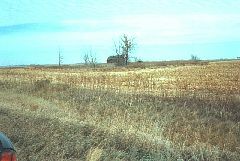 Here is my sequential chronicle of a day of pheasant hunting in Southern Minnesota - Tuesday October 26th 1999 to be exact. You run into these old single room schoolhouse buildings that sometimes double as rural town halls. I remember hunting one day many years ago on election day. Every one of these small town halls had a dozen or so cars parked nearby with the citizenry inside voting. This one may be abandoned. 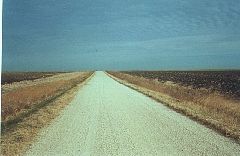 This is just a view down a country road. You cannot shoot 500 feet from an inhabited house or livestock. 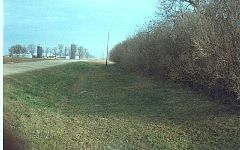 At the left is the ditch in front of a farmhouse where I spotted a rooster. It was the first bird I saw. I pulled into the farm drive to try and take his picture, but he ran underneath the underbrush. Of course you can't shoot at a bird this close to a farm. Opposite is a pile of rotting railroad ties. 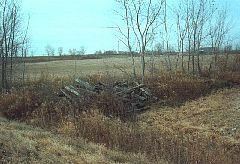 Southern Minnesota has several rail lines that have been ripped out: their tie plates, spikes, bolts, angle bars and rail gathered and sold for scrap. Sometimes the farmers buy the land and plow it up. 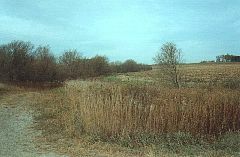 Often the railroad bed remains and is a good place to walk for pheasants. 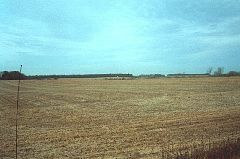 Here is a view of a huge field. I don't think it's a picked soybean field, because although you can still see the rows I think there would be more dirt between the rows. Note the car antenna - bad, bad photographer! 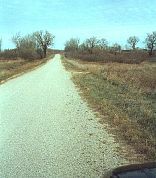 Opposite is a the heavy cover along a country road. It takes this kind of cover for pheasants to have a chance to survive the winter. More heavy cover. I walked down along the edge of this field drive and came back through some heavy cover on the left but didn't kick anything up. The next time out three weeks later my friend Greg shot a rooster right here. 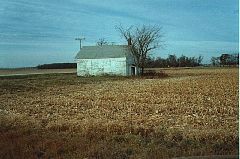 Here is where I got my first pheasant. I spotted him out of the corner of my eye on the left side of the road. He was on a field drive and scrunched himself down and slipped into the ditch. He flew and I shot at him but missed. 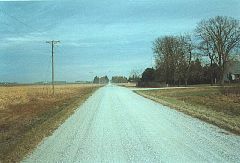 Note both sides of the road are plowed fields. This made him just fly down the road and land in the ditch. I drove back down the road, spotted him again, got out and shot him as he flew right to left. He's probably a first year rooster. You can clearly see the white "ring neck" of this Chinese Ringneck Pheasant. 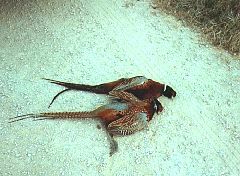 Here is where very quickly I got my second pheasant. I spotted several pheasants at the right side of the box-shaped high grass around this abandoned farm. They were jumping around excitedly like dogs. They had probably been shot at before and my pulling up made them anxious. One rooster flew as I got halfway to the farm, and I missed him. I plunged into the cover and walked toward the building. A hen got up, then a rooster. I got him in a straight going-away shot. I had been hunting for about 2 hours. Three weeks later my friend Greg and I again walked this small area. We didn't kick anything up. We were standing near the building when Greg saw an old piece of farm machinery. As he waded into deep weeds near the building to get a better look, a big rooster flew up and Greg shot him.